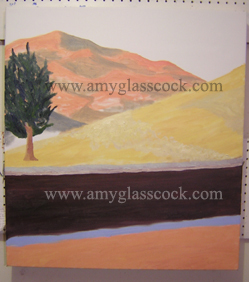 My next painting is based on a photo I took while visiting a friend in Reno. Stay tuned. This is obviously my new painting. 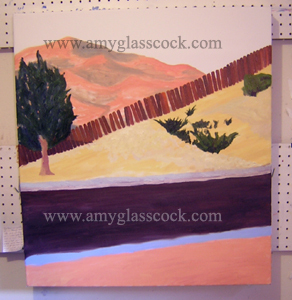 I painted the fence and some shrubbery today. So remember that poem in jr. high about whether good fences make good neighbors? Does anyone know what they ever decided about that? The Bible on CD- Proverbs. 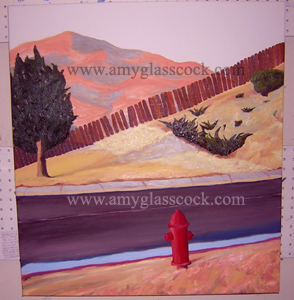 Hey Gregor look: I painted a fireplug! 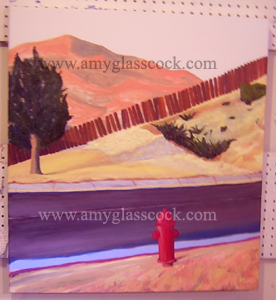 I also worked on the hill, the foreground, the street... I had lots of time to paint today! I worked on the hill in the middle- especially the blue shadow. I worked on the hill some more especially the plants, added some shading to the fireplug, and started to work on the mountains.